Abu Hurairah, may Allah be pleased with him, reported: Allah's Messenger (may peace be upon him) said: When there comes the month of Ramadan, the gates of mercy are opened, and the gates of Hell are locked and the devils are chained. 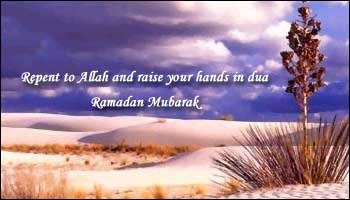 Ibn 'Umar, may Allah be pleased with them, reported: Allah's Messenger (may peace be upon him) said in connection with Ramadan: Do not fast till you see the new moon, and do not break Fast till you see it; but if the weather is cloudy, calculate the month to be thirty days. Abu Hurairah, may Allah be pleased with him, reported: Allah's Messenger (may peace be upon him) said: Observe Fast on sighting the new moon and break it on sighting it. But if (due to cloud) the actual position of the month is concealed from you, you should then count thirty days. Abu Hurairah, may Allah be pleased with him, reported: Allah's Messenger (may peace be upon him) said: Do not observe Fast for a day or two days ahead of Ramadan except a person who is in the habit of observing a particular Fast; he may fast on that day. Umm Salamah, Allah be pleased with her, reported: The Messenger of Allah (may peace be upon him) took an oath that he would not go to some of his wives for the whole month. When twenty-nine days had passed he (the Holy Prophet) went to them in the morning or in the evening. Upon this it was said to him: Messenger of Allah, you took an oath that you would not come to us for a month, whereupon he said: The month may also consist of twenty-nine days. Abu Bakrah, may Allah be pleased with him, reported: The Messenger of Allah (may peace be upon him) had said: The two months of 'Id, Ramadan and Dhul-Hijjah, are never incomplete. 'Adi bin Hatim, may Allah be pleased with him, reported: When (this verse) was revealed: until the white thread (light) of dawn appears to you distinct from the black thread (darkness of night) 'Adi bin Hatim said: Messenger of Allah, verily I keep underneath my pillow two strings, one white and the other black, by which I distinguish night from dawn. Upon this the Messenger of Allah (may peace be upon him) said: Your pillow seems to be very large. For the word string (khait) implies the blackness of the night and the whiteness of the dawn. You have really great work. May Allah give you ajjar.